At yesterday's Brooklyn Book Festival, Prospect Park West author Amy Sohn and JT Leroy mastermind Laura Albert talked about the "mindless malice" of blogging and how the Leroy hoax was actually a way of telling the truth. Will The Mommy Wars Make For Drama? Sohn and Albert sat on a panel with author Robert Dunn and moderator Alisa Valdes-Rodriguez, on the subject of "using real people and real places in a fictional setting." In what might otherwise have been a pretty well-behaved group, Albert provided a breath of weird air. For those who need a refresher, she was the creator of fake transgender prositute-turned-writer JT LeRoy, and the real author of LeRoy's books. At the panel, she seemed a little spacey, admitting that she didn't know how to pronounce "LeRoy" and joking that she was only there because the "I Hate My Neck" [sic] panel was full. But things got interesting when everyone got to talking about men, women, name-dropping, and truth. 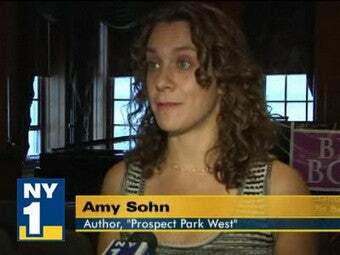 Amy Sohn has gotten criticism for including not only real Park Slope locations but also real celebrities in Prospect Park West, leading Valdes-Rodriguez to opine that "when a woman talks about famous people [...] they're said to be name-dropping, but when a man does it they're said to be capturing pop culture." The panel discussed how women's use of celebrity names got them linked to such devalued forms of writing as gossip columns and (shudder) blogs. Albert said, "'You're a gossip' is another form of 'you're a witch'" — a sensationalistic but catchy way of pointing out that women's speech often gets unfairly branded as malicious, nasty, and even dangerous. This smart point made the next turn the panel took seem extra weird. Sohn started talking about bloggers — wouldn't you know, she doesn't like them. She said, "I'm bothered by the anarchy of the blog world and how people hide behind anonymity, which I think is totally antithetical to what Laura did." And what did Laura do? Well, earlier in the panel she explained her JT Leroy stunt thus: "Oscar Wilde said give a man a mask and he'll tell you the truth [...] and I needed a full body mask." And: "I took the wilds of Brooklyn Heights and made them into the wilds of West Virginia." And "I wrote about what I knew." See, when Albert hid behind the false identity of JT Leroy, she did it to tell the truth. She was writing out of love, whereas bloggers, she says, write out of "mindless malice." Blogging, she elaborates, is "a despair that doesn't know its name." It's very scary to have somebody say that they're going to take this. This came out of my body, and to say that they're going to take them and anything else that comes from me-it's frightening. Albert seems to want everyone to believe her books are living things, whose birthing process for some reason had to include deceiving lots of people. By claiming this, she's totally eliding the money and the fame (albeit indirect) she got as a result of the LeRoy hoax. But perhaps even more upsettingly, she's feeding into the notion that women's writing is like childbearing, that female writers just give birth to stories that already exist in some sort of embryonic form, rather than crafting them like true artists. The panel seemed poised to bust some stereotypes about women in literary culture, but got bogged down in self-promotion and a lame old-media-vs.-new-media debate. Sohn isn't the first to complain about "the anarchy of the blog world," a place where, yes, people can say things that are hurtful and untrue. But as Albert handily showed, old-fashioned book-writers have been doing this for a very long time. And the best response isn't to dismiss a whole class of writers, much as critics sometimes dismiss female writers as "gossips." It's to write honestly and stand by what you write — only one of which Laura Albert has done.